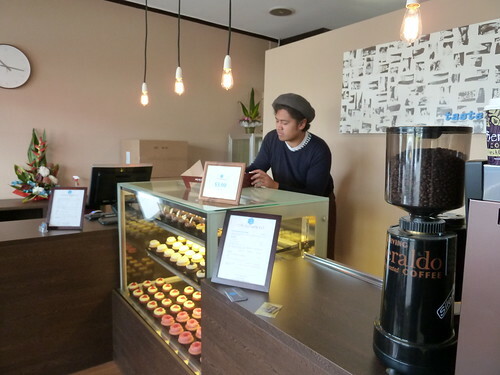 Cupcakes by Paolo are evidently firm believers that "if you build it, they will come". Originally, these swoonworthy cupcakes sold on Saturdays only from the family Filipino takeaway shop at Footscray Market. It was quite a trip to browse the bain marie - oxtail in peanut sauce, spicy blood stew, cookies n' cream cupcake! The business has grown enough for them to open their own standalone store, now on truck-buffeted, windswept Ashley Street. Despite the isolated location, the love is evident inside. Cupcakes by Paolo is a family business. The eponymous Paolo (seen here) is a third-generation baker and is assisted by his parents. They originally owned Masarap, the Filipino bakery in Churchill Avenue, and baked all the bread for their shop Lutong Pinoy in Footscray Market. Now they bake on the premises here in Ashley Street and still supply the bread for Lutong Pinoy's new owners. 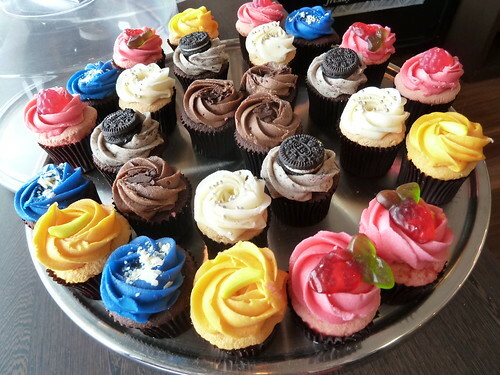 There's a select range of large cupcake flavours. Check out the website for special orders including their mini cupcakes and to drool over all the flavours available. 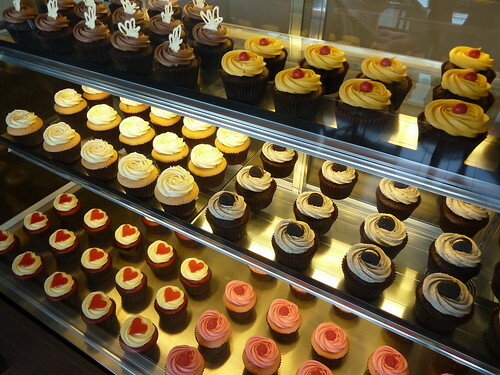 There are two styles at Cupcakes by Paolo - rich, moist chocolate/red velvet bases and very light, sponge-like fruity bases. My favourite are tender chocolatey bases which are complemented perfectly by creamy swirls of frosting. My friend S loves Asian chiffon cakes and as such loves the light, fluffy texture of the fruity/vanilla bases. A cupcake and a coffee is a pretty unreal $5. They're open from 7am if you need your coffee hit on the way to Tottenham station. 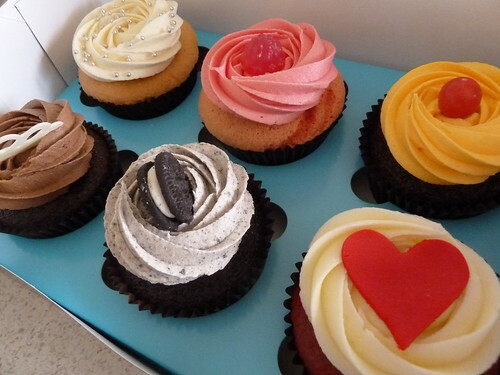 The only hard thing is resisting a cupcake for breakfast! On a Wednesday night, Devonshire Street quiet as a tomb, we did have some trepidation pushing open the door to lonely heart Eat and Love - little did we know they would live up to their name. This little Indian, Bengali and Nepalese restaurant has only opened fairly recently and is full of promise. The decor is sort of Queen of Hearts - quite sweet, very heartfelt. It's sparkling with lots of white tiles and mirrors which reflect the Bollywood movies playing on the flatscreen on the wall. Choose your angle so you don't have to watch yourself dribbling curry down your chin! At first glance the menu seems like a standard Indian restaurant menu, but there are hidden exotic gems. 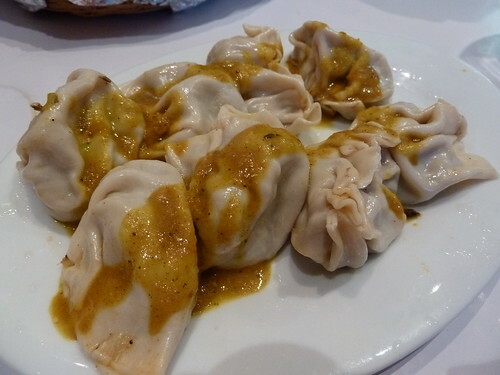 These non-veg momo are Nepalese dumplings in a kind of thick, almost pasta-like skin. They were tender, drizzled with a thin curry sauce and quite nice. 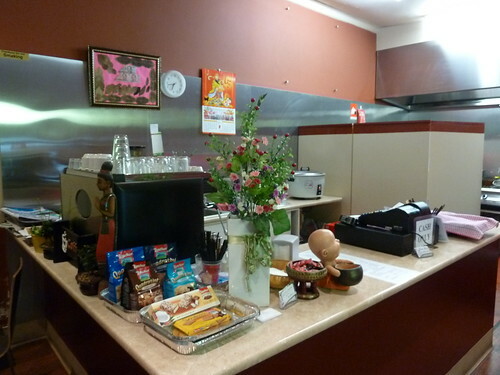 Also try Fusion Cafe and Momo Bar in Footscray for good value momo. The chicken vindaloo was fabulous! Tender, fresh, carefully-cooked chicken in a gorgeous, well-balanced, spicy tomato-based sauce. 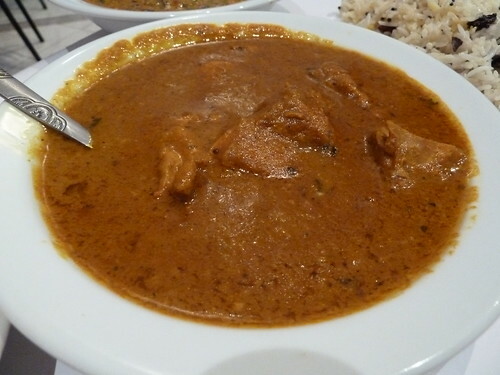 It was not overly oily as much Indian restaurant food can be and indeed, Eat and Love's website assures that they use family recipes. 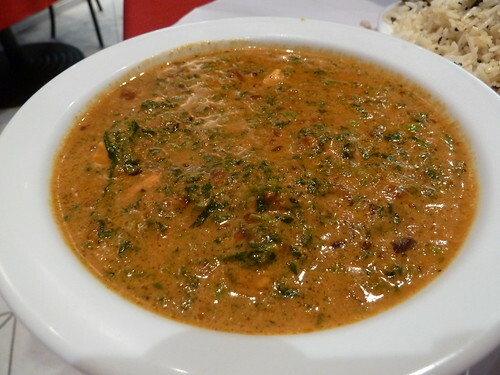 The worst examples of palak paneer (also known as saag paneer) are horrible, just rubbery cheese in a khaki-coloured pureed spinach sauce, with little more than acrid, dried-out ginger strips or a few token bits of tomato. This was not at all like that - the spinach was textured with home-style pureed tomato and just enough cream. Love the touch of authentic fenugreek leaves. Very pleasing indeed. 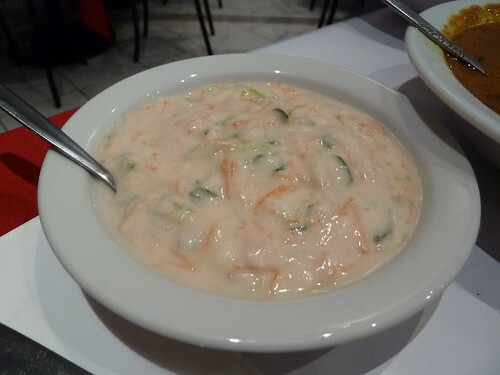 Really loved this raita, thick and sweet with grated carrot. It was much more substantial than the watery versions that abound, and good value at $2.50 - hate how sometimes a tiny serve is more than $4. 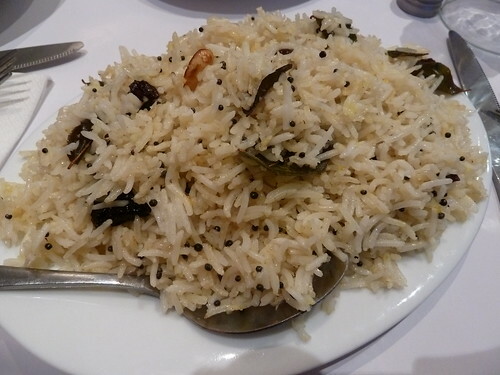 Interesting South Indian rice with coconut powder, curry leaves, dried fruit and mustard seeds. Honestly, I covered this with so much lovely saucy curry flavours, I can't really comment! 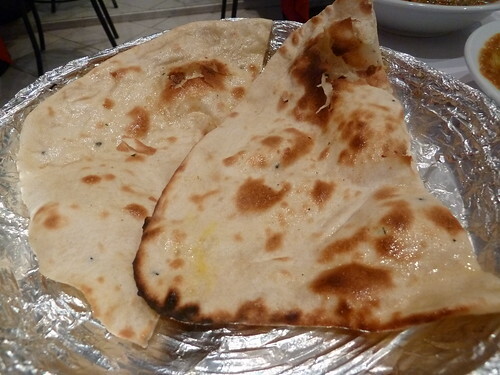 Pretty good naan, perfect for soaking up the last bits of vindaloo sauce. We were so pleasantly surprised how much we loved our meal. The prices are right and when I called back later to check something on the bill, Jack whom we spoke to was a perfect gentleman. Definitely heading back to check out the Bengali/Bangladeshi meal for two, which includes traditional Eastern Indian tuna kebab, "chicken roast" (marinated, shallow-fried chicken apparently) and two varieties of biryani. Check out the website for menu, coupons and deals. We came, we ate and we did indeed love! Thank you Lisa via Facebook for the tip! I am trying a new map format - below the restaurant demographics below there's a link to my Google map. 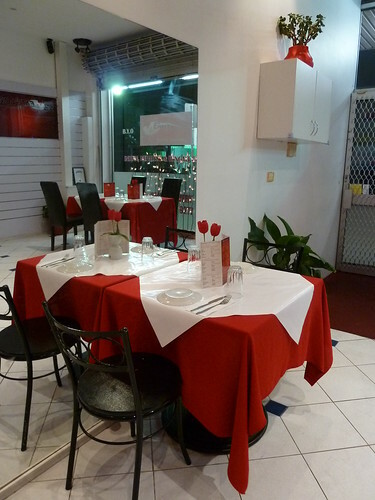 This way you can also discover nearby restaurants by navigating between the pins. Red pins are restaurants, blue are food stores. If any links are broken, let me know. Come on, you didn't think I would grow out of my bad jokes while I was away? I think they are genetic. 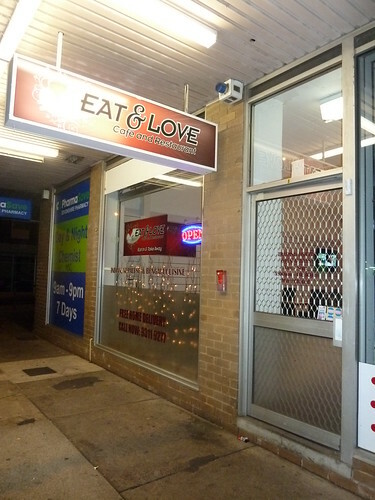 Anyway, Richard R kindly stopped by the Facebook page while I was on the break to give Sweet Rice a big thumbs up - "the yummiest, fresher best value Thai on this side of the Maribyrnong!" This strip of shops is normally just a fly-by for us on the way to the beach. 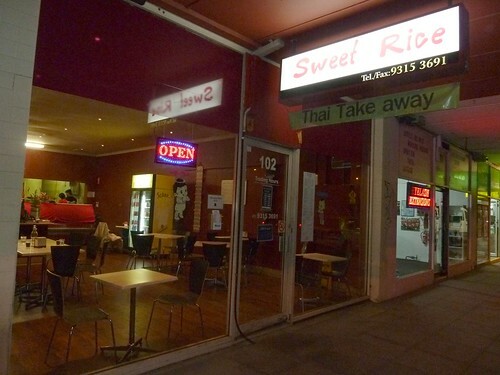 Sweet Rice is a little Thai takeaway that has a small eat-in area. It's a bit lonely at first but the staff were really friendly, bringing us chilled water and little paper cups for the kids and turning on gentle, percussive Thai tunes. It's cheap as chips with nothing on the menu over $12.90. On a small whiteboard are the specials including this fish with green mango salad. It was great - super-crispy battered pieces of really fresh fish with a fabulous, sweet salad of tangy shredded green mango, delicious whole dried prawns, red onion and lots of herbs. A Baklover family must-have - these are baby crabs which have a tender shell you can eat in their entirety. 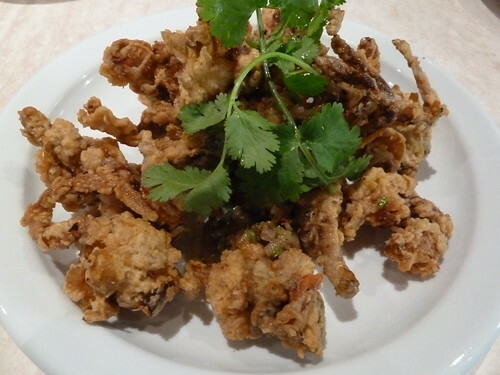 This was great, the crab chopped into two-bite sized pieces with crunchy, curly batter that was not at all greasy. It had a tasty sprinkle of onion and garlic. 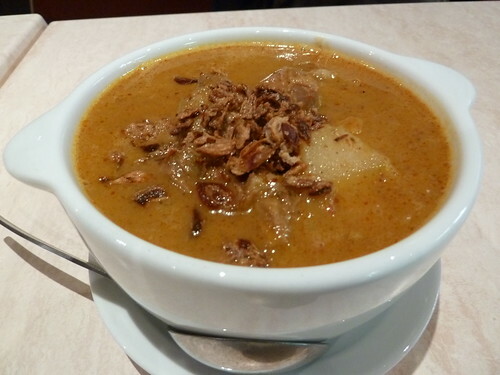 Massaman curries are from Southern Thailand and are apparently Muslim in origin (the name is thought to be a corruption of the word 'Muslim'). I wonder if they are Malaysian-inspired as they feature coconut milk and curry spices, not unlike a curry laksa. This was delicious - very sweet and mild with gorgeous creamy coconut, the beef slow-cooked to lusciousness and the potatoes and carrots totally tender. Ostensibly for the kids but they had to fight the adults for it. 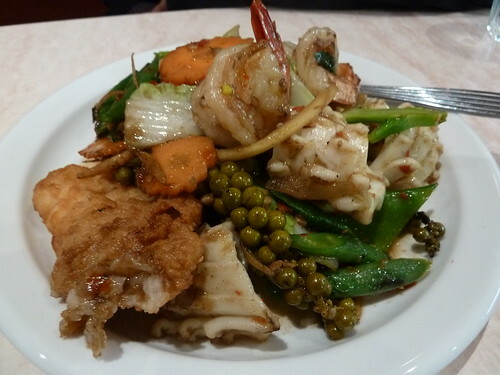 This was a stir-fry of super-duper fresh seafood including proper fresh prawns, very tender pineapple-cut squid and more fresh, battered fish. The vegies were delicious, again very fresh - check out the authentic pickled green peppercorns too! The ingredients spoke for themselves, just accented by a little soy and chilli. My only quibble is there was a faint taste of gas that can happen when there is a LOT of flame used in cooking - I get it sometimes if I put too much oil on vegies or meat and then the BBQ flames up. Still, we finished the lot. 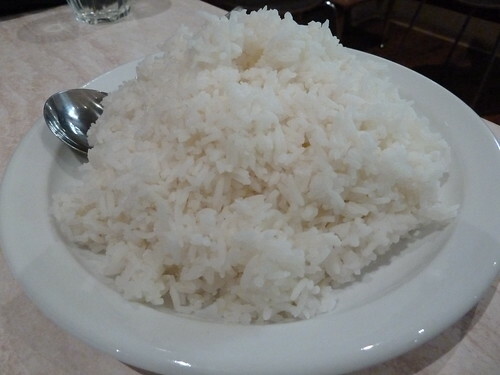 Yes, I know this is a plate of rice, but it was so fragrant I had to mention it! The eponymous sweet rice - glutinous rice wrapped around a purple preserved banana and steamed. Served here hot for eating with mango and coconut ice cream, oh my! 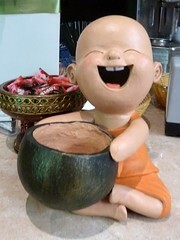 The sticky rice was delicious, comforting and sweet like rice pudding. The ice creams were great, quite closely textured, the coconut tasting of rich coconut milk rather than the more grated coconut flavour you get in coconut gelati. 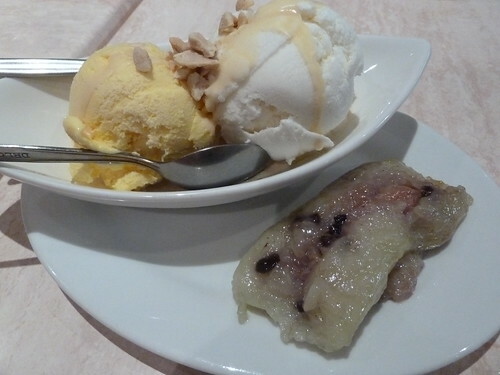 Loved the contrast of the roasted peanuts and, at the bottom, slippery white syrupy fruits. I will definitely be back here for Thai takeaway - it only takes a minute to get to straight down Geelong Road. Everything was quite mild and sweet which perhaps reflects its suburban market, but it was all very fresh, well-made and unbelievably cheap. There are lots of interesting things to explore on the menu like "king prawn chu chee" and "three flavour fish". I am pretty sure the couple who run it are Thai and they are delightful. 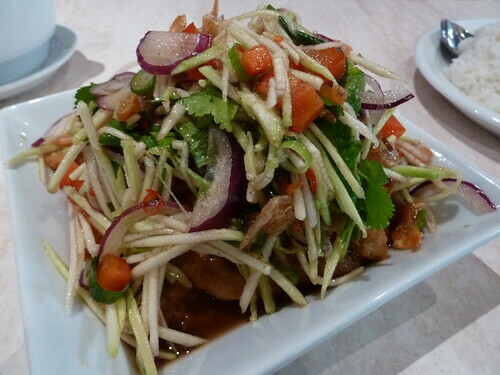 "The yummiest, fresher best value Thai on this side of the Maribyrnong!" - Richard, I think you may be en-Thai-rly right! For Thai ingredients, check out Nathan Thai Video & Grocery, a dedicated Thai grocer in Footscray.